Background Most e-cigarette liquids contain flavour chemicals. Flavour chemicals certified as safe for ingestion by the Flavor Extracts Manufacturers Association may not be safe for use in e-cigarettes. This study identified and measured flavour chemicals in 30 e-cigarette fluids. Methods Two brands of single-use e-cigarettes were selected and their fluids in multiple flavour types analysed by gas chromatography/mass spectrometry. For the same flavour types, and for selected confectionary flavours (eg, bubble gum and cotton candy), also analysed were convenience samples of e-cigarette fluids in refill bottles from local ‘vape’ shops and online retailers. Results In many liquids, total flavour chemicals were found to be in the ∼1–4% range (10–40 mg/mL); labelled levels of nicotine were in the range of 0.6–2.4% (6 to 24 mg/mL). A significant number of the flavour chemicals were aldehydes, a compound class recognised as ‘primary irritants’ of mucosal tissue of the respiratory tract. Many of the products contained the same flavour chemicals: vanillin and/or ethyl vanillin was found in 17 of the liquids as one of the top three flavour chemicals, and/or at ≥0.5 mg/mL. Conclusions The concentrations of some flavour chemicals in e-cigarette fluids are sufficiently high for inhalation exposure by vaping to be of toxicological concern. Regulatory limits should be contemplated for levels of some of the more worrisome chemicals as well as for total flavour chemical levels. Ingredient labeling should also be required. E-cigarette manufacturers should not represent or suggest that the flavor ingredients used in their products are safe because they have FEMA GRAS™ status for use in food because such statements are false and misleading. While it is likely that virtually all flavour ingredients that are popular in confectionary and food products have been included in multiple e-cigarette products, very little has been published on the levels of flavour chemicals in e-cigarette fluids. Farsalinos et al10 analysed e-cigarette refill fluids from seven countries for diacetyl (aka butanedione, often described as giving a buttery flavour), and acetyl propionyl (aka pentane-2,3-dione, often described as giving a caramel or buttery flavour). Both compounds were reported to be found in 74% of the samples tested, and the authors concluded that 47% of the diacetyl-containing samples and 42% of the acetyl propionyl-containing samples could lead to exposures higher than NIOSH safety limits. Bahl et al11 examined 41 e-cigarette refill fluids for cytotoxicity to human pulmonary fibroblasts, human embryonic stem cells and mouse neural stem cells, and concluded that when present, the cytotoxicity was related to the flavour chemicals, especially for cinnamon-flavoured refill fluids. A recent opinion piece in JAMA12 states Research is needed to characterize both the presence of toxic chemicals in ENDS flavorings and the potential adverse respiratory effects of exposure to e-liquids, especially flavorings. Hutzler et al13 analysed 28 e-cigarette liquids from seven manufacturers by gas chromatography/mass spectrometry (GC/MS) and used comparisons with known compound-specific MS patterns to tentatively (and qualitatively) identify the presence of 141 flavour chemicals in one or more of the products. Vanillin, ethyl maltol, ethyl vanillin and menthol were the four most frequently found flavour chemicals, reported to be present in 79%, 57%, 50% and 43% of the 28 samples, respectively. However, since authentic standards were not used, actual concentrations could not be deduced. As follow-up to Bahl et al,11 Behar et al14 ,15 examined cytotoxicity and measured levels of cinnamaldehyde, 4-methoxycinnamaldehyde and vanillin for 10 ‘cinnamon’ flavoured refill fluids. For the three compounds, the highest concentrations were ∼40, 3 and 8 mg/mL, respectively (∼4%, 0.3% and 0.8% by weight or volume). Product labels rarely provide ingredient information beyond the level of nicotine, and the inclusion of propylene glycol and/or glycerol. To provide additionally needed information, we describe determinations of the levels of flavour chemicals in the fluids of a convenience sample of disposable e-cigarettes and refill bottles over a range of flavour types. We assumed that meaningful conclusions could be obtained by analysing 30 products. The e-cigarette fluids examined were selected from a vast and rapidly changing array of products. BLU and NJOY, two brands of disposable-cartridge e-cigarettes, were purchased in five flavours: tobacco, menthol, vanilla, cherry and coffee. Also purchased in the same flavours (from online retailers and local ‘vape’ shops in Portland, Oregon) were refill bottles for tank systems. Refill bottles in five other confectionary flavours (chocolate/cocoa, grape, apple, cotton candy and bubble gum) were also purchased. After dilution with methanol, the fluids were analysed by GC/MS. Using internal standard-based calibration procedures similar to those described elsewhere,16 analyses were performed using an Agilent (Santa Clara, California, USA) 7693 autosampler, Agilent 7890A GC and Agilent 5975C MS. The GC column type was Agilent DB-5MS UI, of 30 m length, 0.25 mm id and 0.25 mm film thickness. For each replicate sample, ∼50 mg of each fluid was dissolved in 1 mL of methanol. One microlitre of the methanol solution was then injected on the GC with a 25:1 split. The GC temperature programme for all analyses was: 35°C hold for 5 min; 10°C/min to 300°C; then hold for 3.5 min at 300°C. No analyses of aerosols generated from the fluids were carried out. Qualitative analyses of the 30 e-cigarette fluids were first carried out here using the NIST 14 MS library,17 and the results were compared with data previously obtained for flavoured tobacco products.16 Quantitative analyses of the 30 fluids were then undertaken, using authentic standards, for a specific list of compounds, which formed the ‘target analyte list’. If reported here, the presence of each target analyte was confirmed by matching GC retention times and MS patterns with results obtained with the authentic standards; the level was determined by comparison with calibration standard runs. The target analyte list included the 70 compounds listed in Brown et al16 plus 20 others, namely aromadendrene, 1,4-cineol, trans-cinnamaldehyde, citronellal, citronellyl propionate, coumarin, decanal, ethyl acetate, ethyl hexanoate, fenchol, limonene oxide, trans-linalyl propionate, maltol, 3′-methylacetophenone, neomenthol, 2-nonanone, pentyl propionate, pulegone, γ-terpineol and 2,3,5,6-tetramethylpyrazine. The vicinal diketone compounds diacetyl and 2,3-pentanedione were not in the target analyte list. Total flavour chemicals were greater than 1% by weight in 13 of the liquids analysed (table 1). Concentration values in mg/mL are nearly equivalent to values with units of mg/g; 10 mg/mL corresponds to ∼1% by weight. Six of the 24 compounds in table 1 are aldehydes, a compound class recognised toxicologically to be ‘primary irritants’ of the mucosa of the respiratory tract.18 For the ‘tobacco’ flavoured fluids, none of the flavour chemicals reported are obtainable at the levels found by adding a tobacco extract to the e-cigarette fluid; while extracts of tobacco may be used in some ‘tobacco’ flavoured fluids, a majority of the ‘tobacco’ flavoured products were found to contain confectionary flavour chemicals. 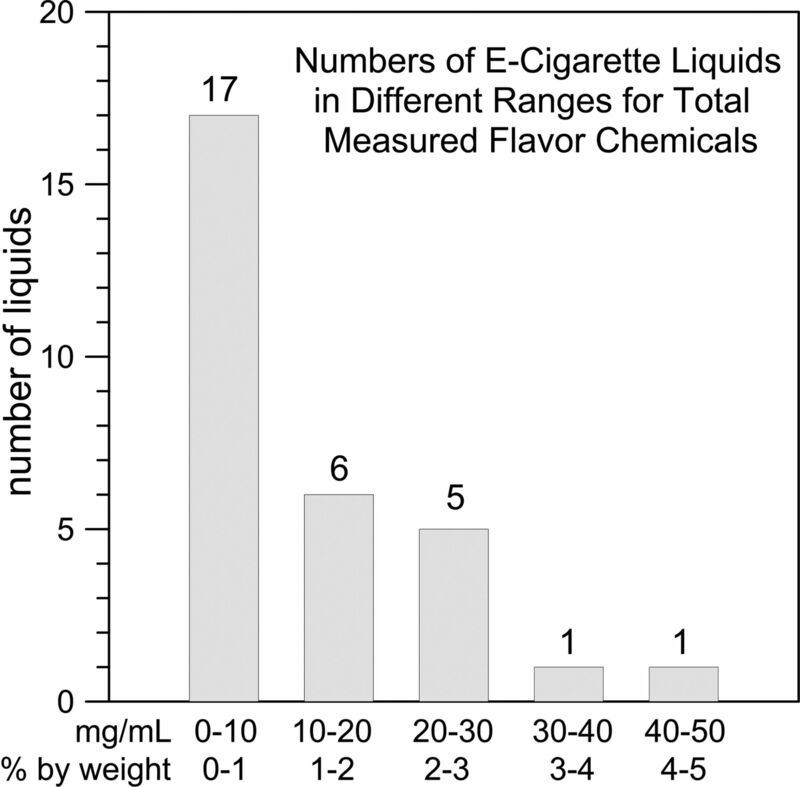 Figure 1 provides a bar plot for numbers of fluids versus per cent by weight for the 30 e-cigarette liquids. Thirteen of the liquids (43%) contained total determined flavour chemical levels greater than 1% by weight. Seven of the liquids (23%) contained levels greater than 2% by weight. Two of the liquids (7%) contained levels greater than 3% by weight. Bar plot of number of e-cigarette fluids out of 30 with total determined flavour chemical levels in five concentration ranges. The array of e-cigarette products is vast and growing daily. As such, this study was unable to provide a comprehensive overview of the levels of flavour chemicals in such products currently on the market. Nevertheless, the results obtained are likely to be similar to what a broad survey would have revealed, and in any case strongly suggest that very high levels of some flavour chemicals are undoubtedly present in a great number of the thousands of products currently available. Recommended 8 h occupational exposure limits by inhalation for benzaldehyde and vanillin are ∼9 and 10 mg/m3, respectively.19 Assuming respiration at 0.83 m3/h (20 m3/day), these values give recommended work-place exposure limits of 60 and 67 mg/day, respectively. For e-cigarette liquid consumption rates, ∼5 mL/day is commonly self-reported in online ‘vaping’ forums. In our data, the brand with rank 3 in total flavour chemicals contained benzaldehyde at 21 mg/mL; the rank 1 brand contained vanillin (4-hydroxy-3-methoxybenzaldehyde) at 33 mg/mL; 5 mL/day then suggests possible inhalation rates of ∼105 and ∼165 mg/day, respectively, twice the recommended limits. Although the group of fluids analysed here represents only a small sample of the available products, the data suggest that a small number of flavour chemicals are particularly popular among manufacturers: for example, vanillin and ethyl vanillin, maltol and ethyl maltol, benzaldehyde and benzyl alcohol, and ethyl butyrate and ethyl acetate. Regulatory actions that should be considered include requiring ingredient identification, limiting levels of some individual flavor chemicals, and limiting total levels of flavor chemicals. Flavour chemicals are present in almost all e-cigarette fluids currently on the market in the USA and globally. Concerns are rising among public health professionals that flavoured e-cigarette products may make e-cigarette use attractive to youth. Second, high doses of some flavour chemicals may be safe when ingested, but quite unsafe when inhaled. Third, toxic degradation products may be produced by reaction of the flavour chemicals at the high temperatures present during e-cigarette use (aka ‘vaping’). Flavoured e-cigarette products do not typically list the levels of specific flavour chemicals present, and most do not identify the major flavour chemicals present. The analyses of 30 products on the US market revealed that 13 were more than 1% by weight flavour chemicals. Chemicals identified included aldehydes (eg, benzaldehyde and vanillin) which could cause respiratory irritation.
. Smoking, E-Updated. Modernized Cigarette Seeks Respectability. Bloomberg View 17 July 2014. http://www.bloombergview.com/quicktake/e-cigarette-update (accessed 24 Jan 2015). 21 CFR Parts 1100, 1140, and 1143[Docket No. FDA–2014–N–0189] RIN 0910–AG38. Deeming tobacco products to be subject to the Federal Food, Drug, and Cosmetic Act, as amended by the Family Smoking Prevention and Tobacco Control Act; regulations on the sale and distribution of tobacco products and required warning statements for tobacco products. http://www.gpo.gov/fdsys/pkg/FR-2014–04-25/pdf/2014-09491.pdf (accessed 10 Aug 2014).
. E-cigarette makers are in an arms race for exotic vapor flavors. New York Times 15 July 2014. http://www.nytimes.com/2014/07/16/business/e-cigarette-makers-are-in-an-arms-race-for-exotic-vapor-flavors.html (accessed 10 Aug 2014). http://online.wsj.com/public/resources/documents/fdaletter20140808.pdf (accessed 10 Aug 2014). Centers for Disease Control and Prevention (CDC). Notes from the field: electronic cigarette use among middle and high school students—United States, 2011–2012. MMWR Morb Mortal Wkly Rep 2013;62:729–30. http://www.cdc.gov/mmwr/preview/mmwrhtml/mm6235a6.htm (accessed 22 Sep 2014). Family Smoking Prevention and Tobacco Control Act. 22 June 2009. Public Law 111-31. http://www.gpo.gov/fdsys/pkg/PLAW-111publ31/pdf/PLAW-111publ31.pdf (accessed 10 Aug 2013). Flavor and Extract Manufacturers Association. Safety assessment and regulatory authority to use flavors—focus on e-cigarettes. May 2014. http://www.femaflavor.org/safety-assessment-and-regulatory-authority-use-flavors-focus-e-cigarettes (accessed 10 Aug 2013).
. Commentary in response to the letter from Farsalinos et al. regarding our publication entitled: “identification of toxicants in cinnamon-flavored electronic cigarette refill fluids”. Toxicol In Vitro 2014;28:1521–2. NIST Standard Reference Database 1A. http://www.nist.gov/srd/nist1a.cfm. (accessed 25 Jan 2015). , eds. Principles of toxicology: environmental and industrial applications. John Wiley & Sons, 2015:346, 496 pages. American Industrial Hygiene Association, Workplace Environmental Exposure Level (WEEL) Values. 2011. https://www.aiha.org/get-involved/AIHAGuidelineFoundation/WEELs/Pages/default.aspx (accessed 24, Sep 2014). Contributors JFP and PAT planned the study. JFP supervised the study. PAT selected the e-cigarette fluids to be analysed. PAT, CDK, JEB and WL carried out the analyses. WL managed the data QA/QC processes, and was assisted by PAT and CDK. JFP and PAT drafted the manuscript. All authors reviewed the manuscript. Funding This work was supported in part by Michael J Dowd, Regina M Dowd, Patrick J Coughlin, the Penrose Foundation and the Cooley Family Fund for Critical Research, of the Oregon Community Foundation.